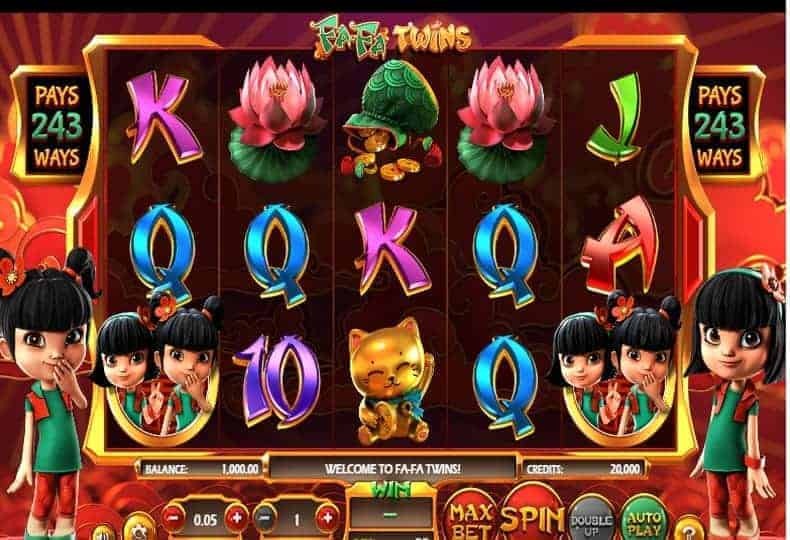 Fa Fa Twins is a 5-reel, 243-ways-to win slot machine from Betsoft Gaming. The game is based on the adorable Chinese 'Fa Fa' twin sisters, and is wonderful fun. Here, we have a superb free version of the game, to play with no download and no registration required. Just sit back, spin those reels and enjoy! While the main winning symbols on the reels include the twins themselves, koi fish, lucky gold cats, a bag of coins, red lanterns, and pink lotus flowers. One of the interesting features is the twin reels that randomly appear upon every spin. You never know which reels it will be, but it can be quite exciting. Even more fun, is when these turn into three or even four matched reels, which can lead to some amazing wins on a single spin. Speaking of Bonus features, Fa Fa Twins is a rather simple and straightforward offering, so the only bonus you can benefit from are the Dual Syncing Reels. Namely, before each spin, at least two successive reels will be the same. Moreover, the reel duplication can extend to include the reels three, four, or even the reel five, which may contribute to a hefty win. Double Up feature is also available, so, after any win, you can press the Double Up button and play the Heads or Tails mini-game to try and double your win by making a correct guess. You can choose to gamble all or half of your winnings. The top-prize on offer is 5,000 coins, that is awarded for landing five Fa Fa symbols on a single line. Obviously this is a rare occurrence, but something that keeps you spinning those reels again and again in hope of hitting the big one. This beautiful slot machine game, made by Betsoft Gaming, has some nice features and cool little touches, which when combined, make it great fun to play. This Betsoft release is a great representative of the fruit machines that any UK punter will be delighted to come across. At the same time, it is also a decent rendition of a pokie that will most probably satisfy the majority of gamblers from both Australia and New Zealand.